Galway City West candidates (clockwise LtoR): Ollie Crowe, Mike Cubbard, Mark Lohan, Sharon Nolan, and Joe Loughnane. However an assessment of the current state of play of politics, locally and nationally, coupled with an analysis of the candidates officially declared and an informed reading of the situation on the ground, will allow for an understanding of what the trends are, and where they may go to from here. Readers can be certain the political parties and the machines behind the Independents are doing exactly the same, and extrapolating information that will inform how to proceed with their own campaigns from here until the day before polling day. Galway City Central's current incumbents are Padraig Conneely and Frank Fahy (Fine Gael ), Ollie Crowe (Fianna Fáil - pictured below ), Mark Lohan (Sinn Féin ), Billy Cameron (Labour ), and Mike Cubbard (Independent ). However Cllr Cameron is retiring, opening up a vacancy that will make this seat the most fought over and coveted in the entire city, especially by the parties along the various hues of red on the left side of the political spectrum. At this point, it is hard to see major change coming in Galway City West and Galway City East. Some faces may change, but not in terms of party, age group, or gender. As things stand now, straight swops might be as much as we get there. 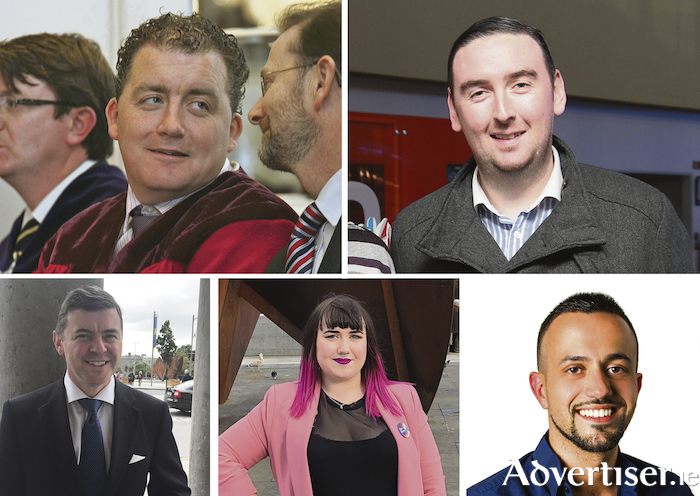 Galway City Central is different, because it contains two newcomers who represent the best chance for new faces, under-35s, and smaller parties, to make the breakthrough into City Hall. The confirmed candidates for GCC so far are: Councillors Conneely, Fahy, Crowe, Lohan, and Cubbard; along with Imelda Byrne (Fianna Fáil ), Sharon Nolan (Social Democrats ), Martina O’Connor (Green Party ), and Joe Loughnane (People Before Profit ). Labour will be running a candidate, but has not confirmed who as yet. Fine Gael should still be in contention to hold its two seats, but the party will remember how close Cllr Conneely came to losing his in 2014, and will not wish to see that happen again. Strict and disciplined vote management, along the lines of that run among Seán Kyne, Hildegarde Naughton, and John O'Mahony at the 2016 General Election, will need to be deployed. Fianna Fáil always goes into an election believing it will win as many seats as it runs candidates. Reality however, tends not to agree. Again, Insider expects the party to hold onto its current seat, but finds it difficult to see Ms Byrne following Cllr Crowe into City Hall. The only way this could happen is if the Labour, Soc Dem, Green vote splits so much it allows FF to sneak in. That said, it is difficult seeing any of those parties transferring to FF, and given FG is remaining ahead of FF in the polls, two seats for FF here is likely to be no more than an aspiration. Insider is confident SF's Mark Lohan and Independent Mike Cubbard [pictured above] will hold their seats, but with Cllr Cameron retiring from politics in May, this opens up another seat for a candidate along the left spectrum. So who has the best potential to capitalise on this? Labour knows that retaining or losing othis seat will be a local indication of whether the party is stagnating, continuing to decline, or is in recovery. As such, the battle to retain Cllr Cameron's seat will be symbolic of where the party's future lies and it simply has to fight tooth and nail in order to hold it. Worryingly for the party it has still to name its candidate. Whoever that person is, s/he will not have the name recognition of Cllr Cameron, or the deep respect and popularity in which he is held. Also, at this stage, the Labour candidate will be playing catch-up to the Soc Dems' impressive Sharon Nolan and the high profile activist and PBP candidate Joe Loughnane [pictured below]. There are figures within Galway Labour who rate Mr Loughnane highly, acknowledging his hard work on the ground and his sincere and principled campaigns as the leading figure in Galway Anti-Racism Network and as a member of Galway Pro-Choice. For this reason, they see him as someone who could, potentially, be in with a shout of taking a seat. Comrade Loughnane though is not everyone's cup of tea, and he does provoke strong emotions in people. That said, much of the criticism is online (always a forum for enlightened debate ) and relates to disagreements some lads had with Joe in university or in a pub 15 years ago when they were all young fellahs. It's often petty, and the people with the complaints really do need to move on and find something better to do with their lives. Judge Joe for the intelligent, passionate, and articulate man he has become, not on the way you both were in adolescence. While Insider does not doubt the quality of Soc Dem candidates John Crowley and Owen Hanley, she expects them to struggle to make a major impact in Galway City West and East respectively. With Cllr Cameron's retirement, Labour still in the doldrums, and that seat begging for a left/liberal candidate to fill it, Sharon Nolan [pictured above] represents the Soc Dems' best - perhaps only - chance to win a seat at LE19. Still in her twenties, Nolan has become one of the city's most prominent activists in recent years in LGBTQ+ issues, gender recognition, and better trans healthcare. She was co-convenor of the Together For Yes campaign in Galway, and was chair of Galway Community Pride, overseeing the most successful Pride festival in Galway to date. She has experience where it counts. Ms Nolan needs to tap into the contacts and goodwill she amassed from the Repeal campaign, and Pride, and rally it around her in May's Local Election. Many of those who fought with her in that campaign would undoubtedly like to see someone with Ms Nolan's views in City Hall. If Ms Nolan is to stand a chance of being elected, she needs those comrades from that referendum to come out in force for her. Social media is important in winning like-minded and potential like-minded souls to her cause. It's an important part of modern campaigning, but not at the expense of all else. An election campaign need canvassing door to door, a presence on the streets, meeting people, and manning those stalls on Shop Street. There is a seat there to be won, but only if those who stood with her in May 2018 do so again in May 2019.